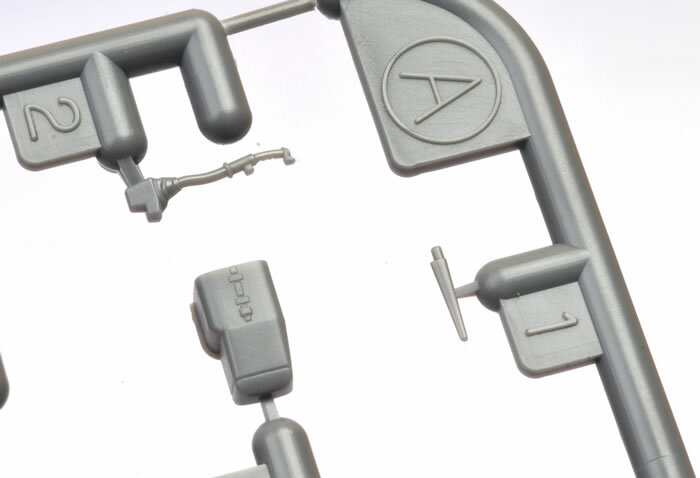 Contents and Media: 49 parts in grey coloured plastic, six parts in clear, two polythene caps plus markings for two aircraft. Advantages: Ingenious design and engineering; superb fit; restrained surface detail; high level of detail; useful options.. Disadvantages: A few ejector pin marks. Recommendation: Even though 1:72 is not my most preferred scale, this is a remarkable kit and a joy to build. The Messerchmitt Bf 109 F represented a major transformation compared to the squared-off lines of the Emil. This sleek hunter now featured a new large aerodynamic spinner, streamlined cowling and rounded wingtips. The installation of the Daimler-Benz DB 605 A engine in the Messerschmitt Bf 109 G increased power, but an upgrade in armament, armour and options resulted in a corresponding increase in weight. The once nimble fighter was becoming overloaded as more missions were demanded of it. Even so, the Gustav remained the workhorse of the Luftwaffe, with more than 12,000 of the G-6 variant alone being produced. The Messerschmitt Bf 109 G-6 was immediately recognisable thanks to the two prominent bulges on the engine cowling. These were required to clear the ammunition feeds of the larger 13mm MG 131 machine guns with 300 rounds per gun. During the course of production, a number of significant changes and improvements were made to the Bf 109 G-6. These included the fitting of a simplified clear-vision canopy, pilot’s head armour from armoured glass to improve rear vision, a new tall tail fitted with several styles of rudder, and more. Armament could vary widely too, with fighter-bomber versions, “gunboats” equipped with 20mm cannon gondolas under each wing and photo-reconnaissance aircraft just to name a few. 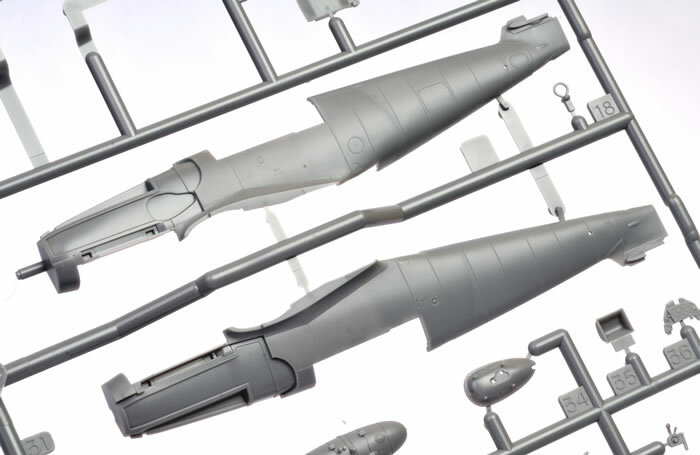 Until now, the best Messerschmitt Bf 109 G-6 kit in 1:72 scale has been the Fine Molds family. 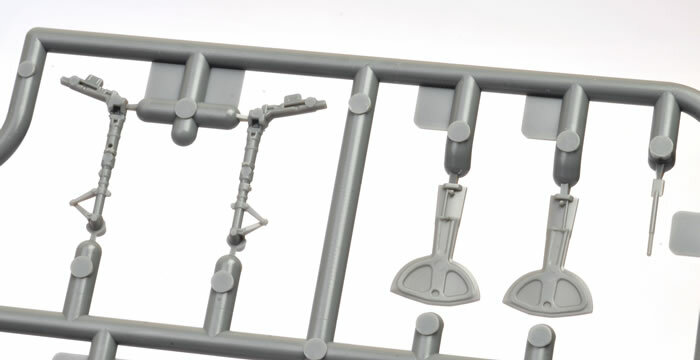 Some of the sprues mould date back to 2005, with the specific G-6 variant being released in 2007 – well over a decade ago. Shapes and surface textures still looks good today but it does suffer from a one-piece windscreen and basic cockpit detail. Another Bf 109 G-6 contender in 1:72 scale is the AZ kit, which is nice in a lot of ways but bears the hallmarks of a limited run kit in others. 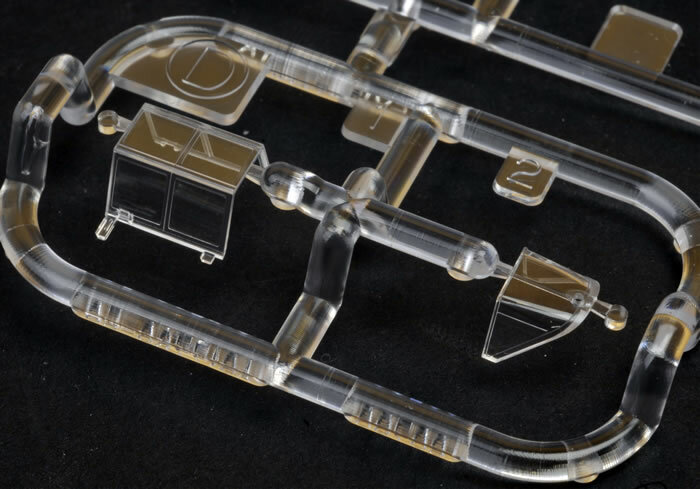 It will require more clean-up and care than a mainstream injection moulded model. Also worthy of mention is the Airfix 2009 release Bf 109 G-6. 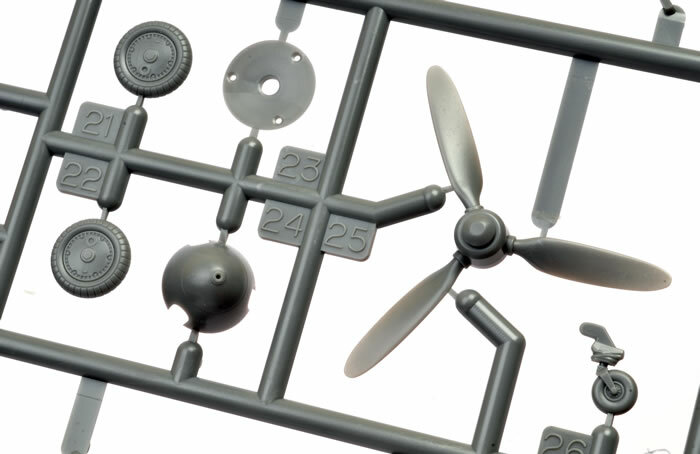 Many of Airfix’s recent releases have been little gems, but this kit is not one of those. It is a disappointment in many respects, including accuracy and lack of detail. 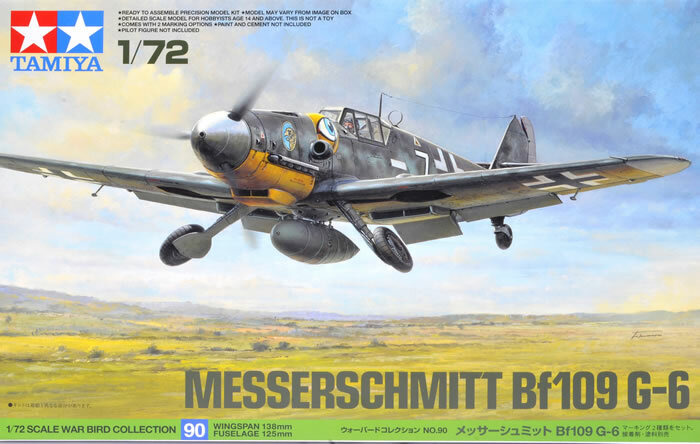 Tamiya's brand new 1:72 scale Messerschmitt Bf 109 G-6 best represents a mid-production aircraft from the Messerschmitt Regensburg factory. 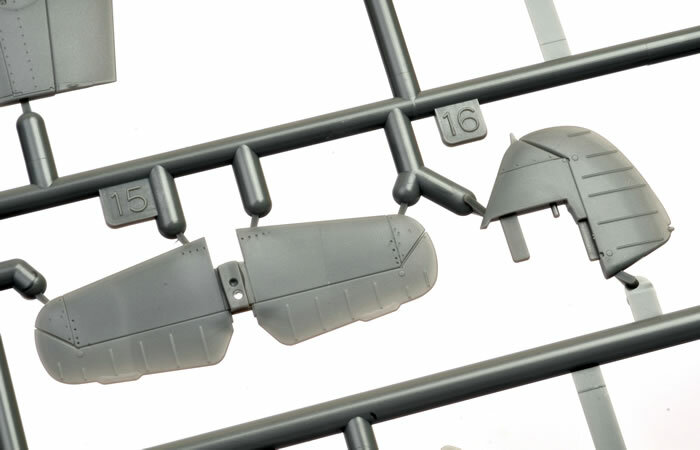 The model features the early framed canopy, Galland Panzer head armour, the short tail and standard stowage compartment behind the pilot's head. 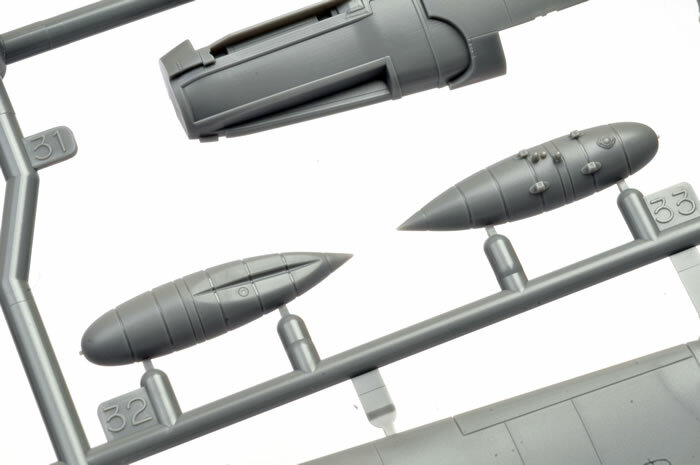 Unlike the recent 1:48 scale kit, this model does not include other options for Trop or gunboat variants, nor are there any hints of later variants in the box. A 300 litre drop tank is included though. 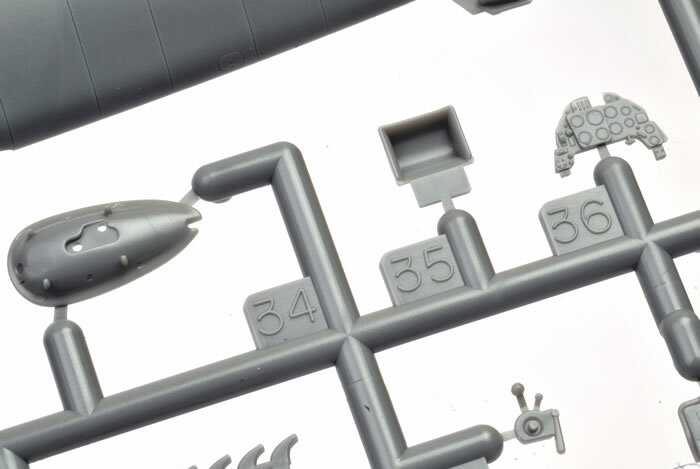 The kit comprises just 49 parts in grey coloured plastic, six parts in clear, two polythene caps plus markings for two aircraft. Parts breakdown is fairly conventional. 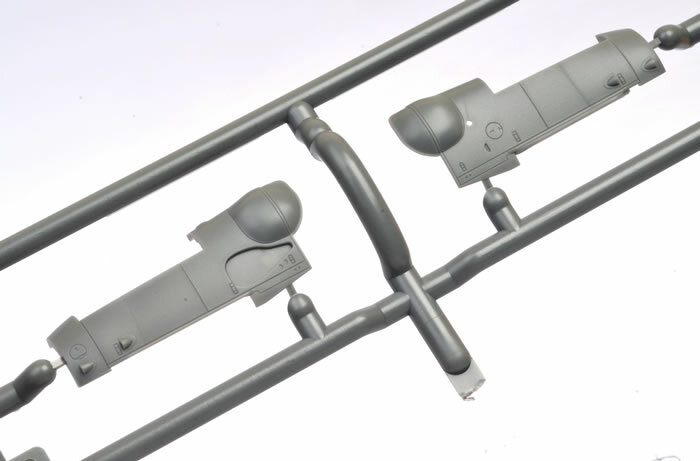 The main fuselage halves are moulded as one main piece each with inserts for the side cowls and upper gun cowl (these are “skins” over a structural nose mount), lower cowl and the section directly behind the pilot’s head. The fin and rudder is also a separate single part. 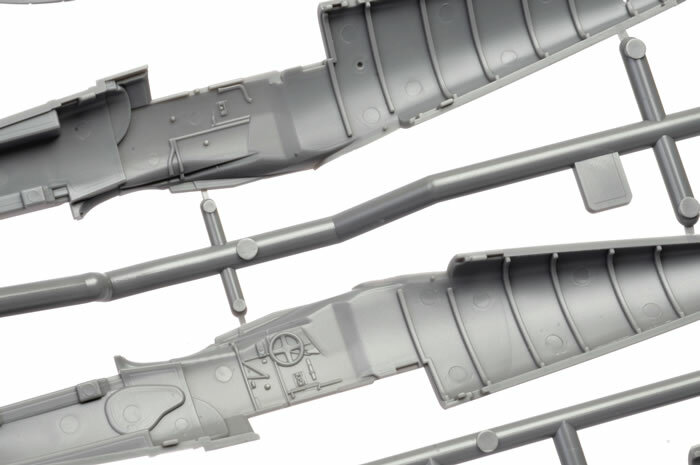 The fuselage halves are moulded as standard Bf 109 G-6 with no umbrella pips or additional access hatches that need to be filled and sanded. Cockpit detail is excellent for this scale. 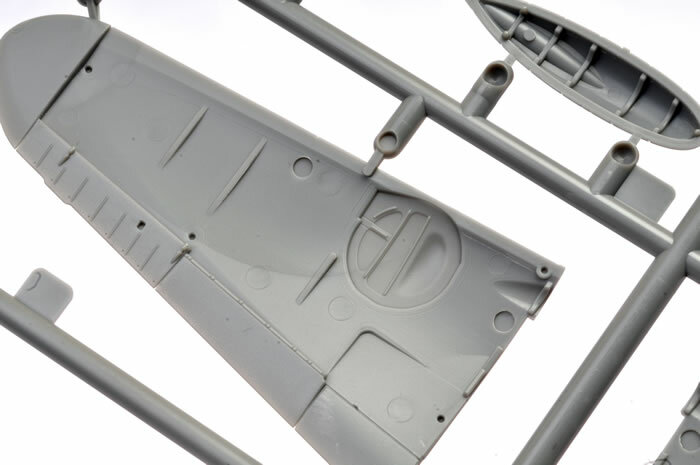 Some detail is moulded directly onto the fuselage sidewalls. 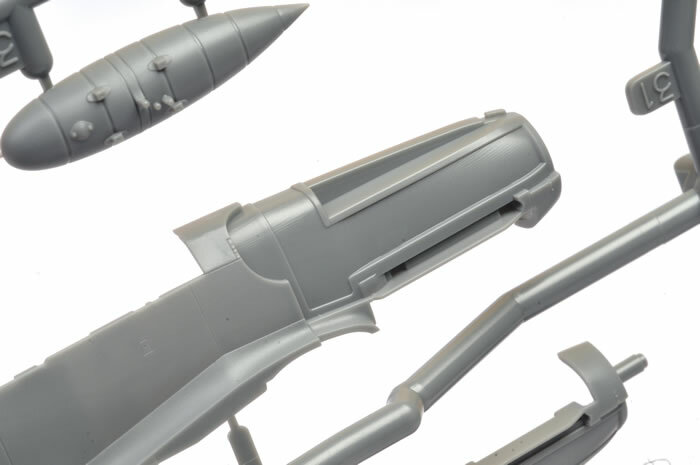 There seems to be a few alarming ejector pin circles here, but they are all covered up when the other cockpit parts are glued in place. The sidewalls are enhanced with separate parts for the switch panel, fuel line, oxygen equipment and throttle quadrant. The instrument panel is supplied with decals for the dials. 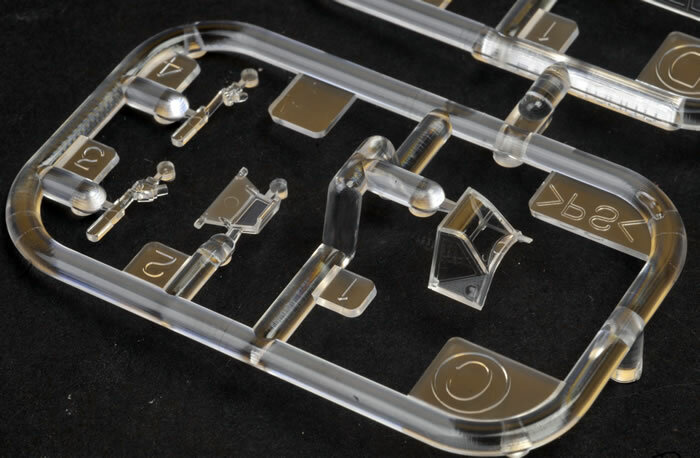 These look great in place - just make sure you line up the instrument decals with the raised plastic bezels. The rudder pedals are cleverly moulded to the firewall, and the one-piece cockpit floor and rear bulkhead looks great when the separate seat bucket, co-axial cannon cover and control column are in place. Decal harness straps are included for the seat too. The inner trim wheel is also mounted to the cockpit floor which adds to the general busy look of the sidewalls. 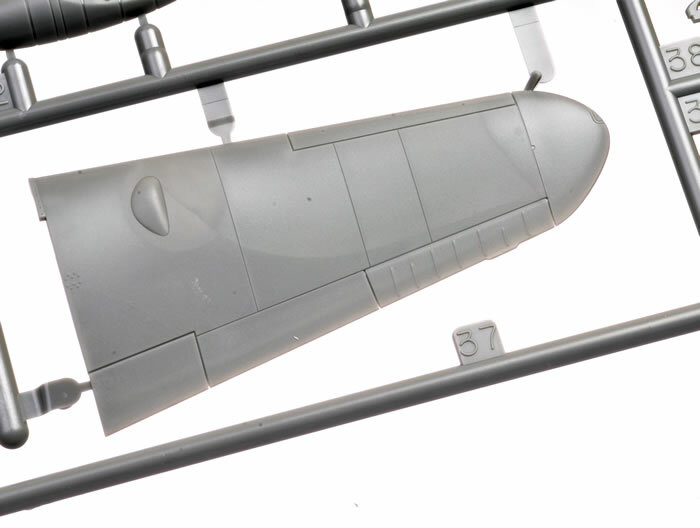 The windscreen is moulded with a small section of the fuselage. The canopy has two tabs moulded to the starboard side to establish a stout attachment point when posed open. 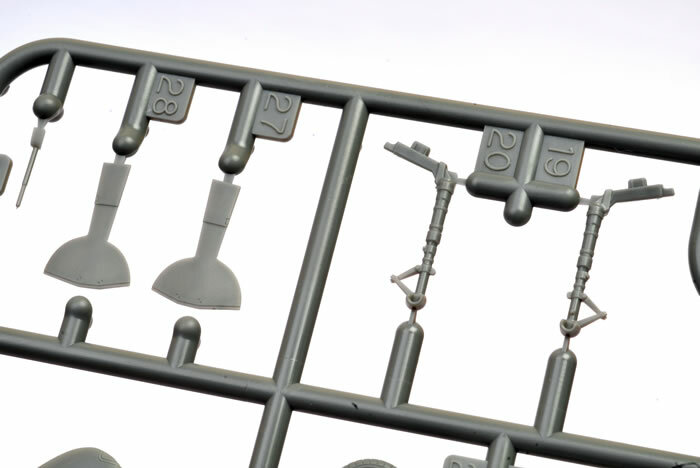 If you want to pose the canopy closed, just snip off the tabs. 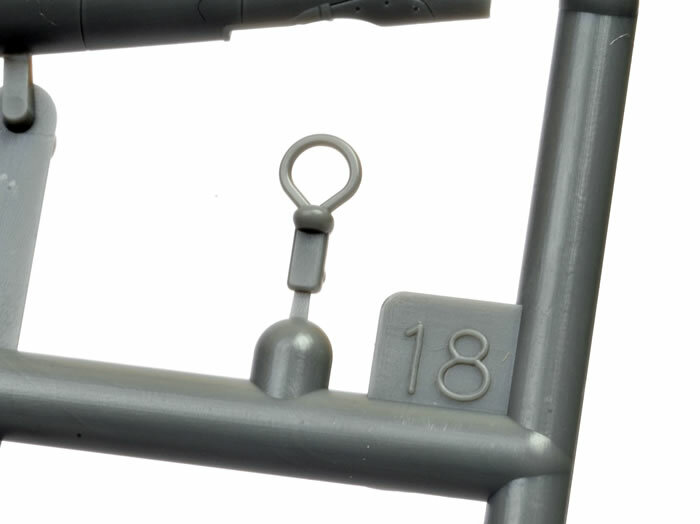 The main section of the canopy is moulded with two locating pins for a default "open" position. If you want to display the canopy closed, just slice off the pins. The wings comprise a full span lower section and separate upper halves with the wheel bulge accurately recessed into the ceiling. The main wheel bays represent zippered canvas covers at the rear and sides. All control surfaces including flaps and leading edge slats are moulded in place and fixed in neutral / retracted positions. The horizontal tail planes are moulded as a single part, including the elevators. The fin/rudder is located via a long stout tab and pin. Each undercarriage leg is moulded with a long angled tab. This is glued into a recess in the lower wing, resulting in a robust join with perfect rake and splay. The recess is then covered by the lower wing centre panel, which doubles as a mount for the ETC rack. 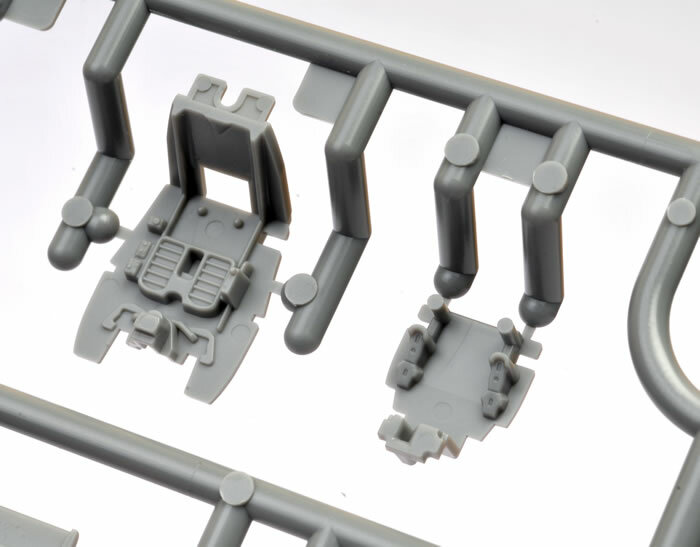 Of course, this means that you will have to paint the model before fitting the undercarriage legs, but fit is so good that this will not be a problem. The 300 litre drop tank is offered as an option. The pitot tube is moulded separately with a small section of the lower wing, which should ensure a stout connection. The DF loop is also attached via a substantial locating pin. Masks for the canopy are not included here, which is a shame as we can use all the help we can get for masking the framed glasshouse canopy in this small scale. 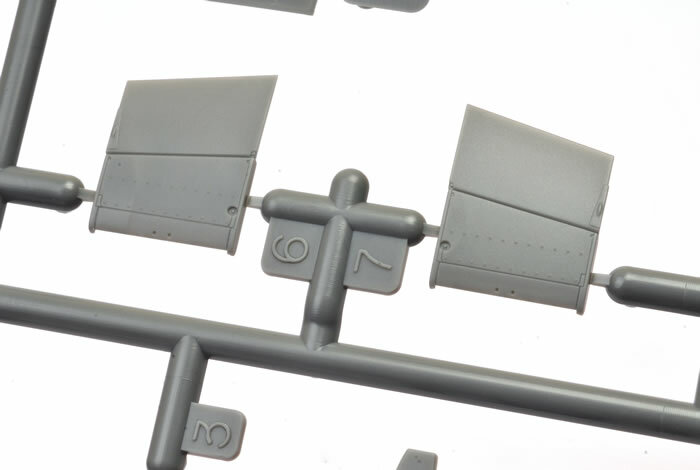 Markings are supplied for two mid-production Messerschmitt Bf 109 G-6s, both finished in RLM 74, 75 and 76. Comprehensive stencil markings are contained on the single decal sheet. Even though 1:72 is not my most preferred scale, this is a remarkable kit and a joy to build. Tamiya did not simply scale down their recent 1:48 scale Gustav – they started from scratch taking into account the practicalities of the smaller scale. We don’t find an engine or interchangeable nose, but with this model Tamiya has delivered a perfect builder’s kit. The surface textures are subtle and convincing, so much so that it is difficult to pick what scale the model is from photos alone. Detail in the cockpit is excellent, and fit is superb, as you would expect. 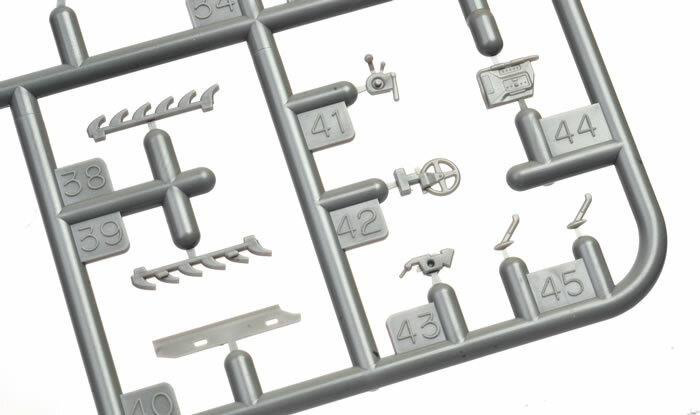 This is undoubtedly the best Messerschmitt Bf 109 kit in 1:72 scale.